Inferno, by Dan Brown, takes place in Florence and Venice, Italy; and Istanbul, Turkey. The plot is based on Dante Alighieri's masterpiece, the Divine Comedy, and there are many references to this work and its author. In Inferno, you'll also get a scholarly look at the art and history of Florence, Venice, and Istanbul. Robert Langdon and his new partner, Dr. Sienna Brooks, start their quest in the Boboli Gardens, which is a huge park behind the Pitti Palace (also known as Palazzo Pitti). Enclosed by walls, the entrance to the extensive gardens (ticket required) is through the Pitti Palace. Inside the gardens are sculptures, fountains, flowers, tree-lined walkways, and hidden grottoes (of which you will learn more about in the book). The Vasari Corridor is a secret passageway, a little more than .5 mile long, that connects the Pitti Palace and Boboli Gardens to the Palazzo Vecchio and Uffizi Gallery, across the Arno River. The elevated walkway crosses the river above the Ponte Vecchio where there are windows for views. Inside the corridor, that can only be visited on a special guided tour, are more than 1,000 works of art. Reservations for the tours are required. The Palazzo Vecchio, which is Florence's city hall, dates back to the late 14th century. It's one of Florence's most famous monuments, and its tower rises above the city (seeing the tower is how Langdon figures out where he is at the beginning of the book). Rooms are decorated with works and frescoes by several Renaissance artists. While it still houses Florence's government, most of the building is now a museum. Palazzo Vecchio sits on the beautiful Piazza della Signoria. Connected to the palazzo is the famous Uffizi Gallery, which is one of Italy's top museums and one of the most important in the world for Renaissance art. The Baptistery of Saint John, or San Giovanni, is one of the oldest buildings in Florence. Built in an octagonal shape, the Baptistery is famous for its gilded bronze door, Porta del Paradiso, whose panels hold reliefs of Biblical scenes. The Baptistery doors are now replicas of the original, which are kept in the cathedral museum. Many famous Florentines were baptized inside, including Dante Alighieri. When Robert and Sienna arrive in Venice by train, they immediately head to the Grand Canal to get to Saint Mark's Square. Venice's Grand Canal, Canale Grande, is like Main Street to the city built on canals, cutting through the middle of Venice and crossed by only four bridges. Since it's the main waterway, the canal is full of all types of boats, from gondolas and water buses to private boats and fishing boats. Although the most common way to get to Saint Mark's Square is on the number 1 Vaporetto, it's also the slowest. As a result, Robert, Sienna, and their new companion hire a private boat. Basilica San Marco, Saint Mark, is Venice's main church and a top example of Byzantine architecture adorned with Romanesque and Gothic touches. The basilica, consecrated in 832, is dedicated to Venice's patron, Saint Mark, and holds his relics as well as many treasures including stunning golden Byzantine mosaics and paintings by leading Venetian artists. Of note on the exterior are the five domes crowning the church, turrets, multi-colored marble columns, and the three arches of the main portal. Also featured in the book is St. Mark's Clock Tower, from which Langdon notes, James Bond had thrown a villain in Moonraker. The Doge's Palace, Palazzo Ducale, was the seat of power for the Venetian Republic for about 700 years until 1797. The palace was the residence of the Doge, the ruler of the Venetian Republic, and held government administrative offices, law courts, ballrooms, grand halls, stairways, and prisons. First built in the 10th century, the palace underwent several renovations and expansions and current building is primarily Gothic. The interior was decorated by some of Venice's top artists. The Palazzo Ducale is open to the public, and one of the best ways to see it is on a Secret Itineraries Tour. The story concludes in Istanbul with a visit inside the stunning Hagia Sophia, built in the sixth century as a church. In 1453, it became a mosque and it's now a museum that's open to the public. The interior is filled with stunning Byzantine mosaics. There's also a scene in Istanbul's spice bazaar. While in Florence, Robert Langdon stays at the Hotel Brunelleschi, which is a four-star hotel in the heart of Florence near the Duomo and Dante's House and a short distance from the ​Ponte Vecchio. 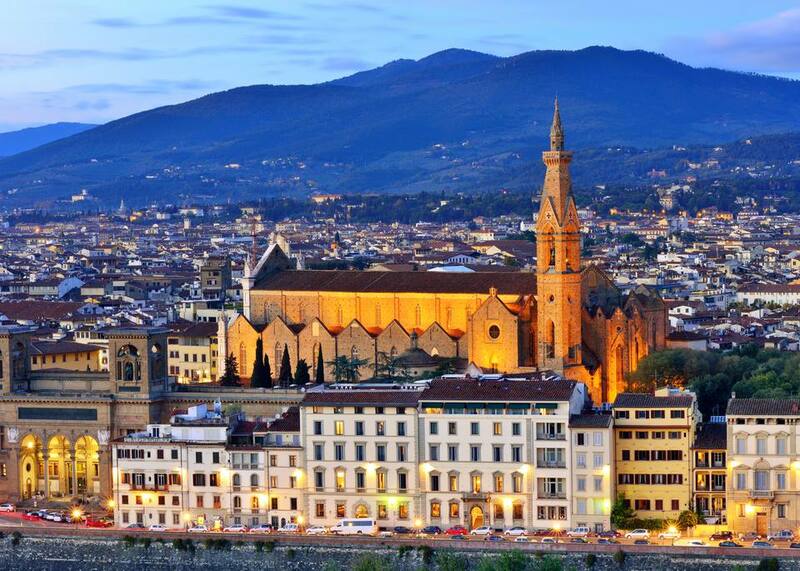 The hotel includes a restored ancient tower believed to be the oldest building in Florence and a restored medieval church. There's a small private museum in the tower with finds from the restoration. At the end of the book, Robert Langdon, now alone, returns to Florence where he goes to the Cathedral of Santa Maria del Fiore or the duomo. The duomo was designed in 1296 and built on the remains of a fourth-century cathedral, but the dome was added later. Known as Brunelleschi's Dome, it was completed in 1436 and was the biggest in the world until the construction of Saint Peter's Basilica in 1615. The cathedral's interior is largely unadorned although there are a few pieces of art, including a fresco of Dante and his Divine Comedy. Finally, Robert returns briefly to the Palazzo Vecchio before his flight back to Boston. Visit the Florence sites featured in Dan Brown's book, Inferno, on a unique guided tour led by an art historian, booked through Select Italy. On this tour, you'll follow the route of Robert Langdon and Dr. Sienna Brooks, the main characters, visiting the places they went while learning more about the monuments and symbols from the art historian. Angels & Demons, another book by Dan Brown that was made into a movie, takes place in Rome and at the Vatican. Saint Peter's Basilica, one of the world's largest churches, and the huge Saint Peter's Square dominate the Vatican and figure prominently in the movie. Where Can You See Greek Temples and Towns in Italy?